 A recent highlight is Adam Roberts's long review of Minority Report, which begins "The symbolic Oedipal psychodrama elaborated by Minority Report is so egregious, so unmissable on-screen, that it is hard to escape a sense of deliberate over-cueing by scriptwriters and director." Also, reviews of books by Clive Barker, Ben Jeapes, Jeff VanderMeer, and others; plus news, features, etc. News about Warren Lapine & Andy Porter, Charles Sheffield; awards, deaths, fans, changes of address; outraged letters; Thog's Masterclass. Website of annual European review magazine of science and SF, edited by Jonathan Cowie. Updated intermittently.  Four articles have just been posted, beginning with The State of UK SF Publishing by Jonathan Cowie, and three science essays by Jack Cohen (asking, is biology a science? ), Ted Nield (are scientists expecting the impossible? ), and Peter Cotgreave (should we trust scientists?). See links from this page. This issue has fiction by Bruce Boston and Harry Shannon, sample chapters from Harry Shannon, Scott Nicholson, and Rie Sheridan, and interviews with Tobias S. Buckell, Teri A. Jacobs, Myra Nour, and Mike E. Purfield; plus news, reviews, links, etc.  Three stories have been posted so far in August, two by Neil Williamson, one by Nathan Ballingrud. Available on the web or PDF (click on date above), this issue has a horror story by Samuel Minier, dark fantasy by Christopher Rowe, flash by Kyri Freeman, and a classic by H.P. Lovecraft. Charles Coleman Finlay reviews Jack Dann's novella "The Diamond Pit", and Lee Battersby reviews 4 of the 5 short story nominees for this year's Hugo Awards.  A series of short-shorts are being posted by writers who attended the Rio Hondo Writer's Workshop in Taos, New Mexico; so far stories by Walter Jon Williams and Sally Gwylan are available, along with background by Ellen Klages and recipes by Williams. Otherwise the 'zines regular features continue: Bruce Sterling's weblog, David Langford's news bits, Michael Swanwick's vignettes, Richard Kadrey's nanotales. Editor Eileen Gunn recently announced that, the webzine's generous grant having run out, a fundraising drive will be held this month and next with works of art contributed by Ursula Le Guin, Vonda McIntyre, Howard Waldrop, and others; details to be posted shortly.  Original stories posted recently are by Patrick O'Leary, Robert Reed, and Dave Hutchinson, in addition to a classic by Peter S. Beagle, all linked from the archive. Michael Swanwick is up to Cerium.  Last week's Issue 276 featured that long interview with Robert Silverberg, reviews of Harry Turtledove and Jack Williamson books, and a column by Michael Cassutt about the lack of "real futures" in movies and especially TV. This week, John Clute reviews two books by Carol Emshwiller, while others review new books by Laura J. Mixon and Lisa Goldstein. The Hugo Awards poll remains open. The lead feature is an interview with Kage Baker conducted by Nick Gevers. Further down is another interview, with Karin Lowachee; reviews of books by Ben Jeapes, F. Paul Wilson, Laurie Marks, Paul Di Filipppo, and others; a review by Rick Norwood of Signs; and "second look" reviews of works by Norman Spinrad, Clark Ashton Smith, and others. August 1st posts included an interview with Karl Schroeder.  Articles this month include an interview with Jon Courtenay Grimwood and an essay on magazine serials by Rich Horton [in part spun-off from his review column here a couple months ago]. Other recent posts are fiction by Kenneth Brady and Sean Klein, poetry by Jonathan Price and Phil Wright, and reviews by Nick Brownlow and Paul Schumacher. Editor Mohanraj is interviewed at BookSense by Gavin J. Grant, though for her erotica, not for this webzine. Anthology of original fiction, the first written-for-Fictionwise anthology, with stories by authors who've been with Fictionwise since its beginning in June 2000, including James Van Pelt, Vera Nazarian, Alan Rodgers, Tom Gerencer, Tobias S. Buckell, and the editor -- 66,000 words in all. 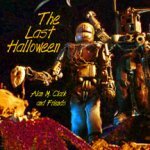 A more ambitious anthology is in preparation for Halloween. Interactive CD ROM "story sculpture", in pdf format, suitable for both PCs and MACs; by Alan M. Clark, Paul Groendes, Marti McKenna, Kenneth Brady and Dana Swisher, with original music by Michael M. (or 'Mule') Green. The description reads: "This is not a game. It is not a book. Story Sculpture is a new digital art form of non-linear story-telling, blending sculpture, photography, painting, music, writing, audio tracks and animation into an adventure for the imagination." See this page for a sample of how it begins: a complex artwork with instructions to turn on the sound, examine the picture for hotspots, read the words...and explore. Clicking on hotspots within the opening artwork leads to detail artwork, some with text, accompanied by strumming piano music; further clicks lead to increasingly detailed artwork, some adding animation, or audio tracks of dialogue by the various characters, sometimes warning "Hah! Clicking here will do you no good!". It's not so much a story, as a puzzle to figure out. If you get stuck, there's a page of "Questions and Possible Answers". See Alan M. Clark/IFD Publishing for ordering information. Subtitled "Stories of a Future Mars", this is a collection of 5 hard SF stories, with illustrations by Wolf Read, first published in Analog and Asimov's -- "Morning on Mars", "The Day of their Coming", "Comet Gypsies", "A Life on Mars", and "Martian Valkyrie" -- along with brief 2 or 3 page interludes. Available in Microsoft Reader format, which vocalizes the text as you select it (if your PC has that option turned on). The audio is neat, but the MS Reader format has its irritations, principally that there's no actual table of contents listing the story titles (we had to page-down through the entire ebook to compile the list of stories above), and that there's no way to page-up to the cover image -- you have to use the Go To menu to do that. Those issues aside, this is a worthwhile collection of stories by a hard SF writer who's never gotten the attention he deserves -- perhaps because he's never published a novel, or a physical book -- since many of his stories constitute a unified future history, with hard SF credentials, worthy of Larry Niven or John Varley before him. Recommended. The links on the title and cover image are to the Amazon page; alternately, here's the Scorpius Digital Publishing page about this e-book, and here's a page about the author [scroll down]. Science Fiction Weekly's reviews and interviews are often linked in advance from the SciFi.com homepage; here for example is Patrick Lee's review of Signs (he gives it an A-), and here's a long interview with Robert Silverberg. But note that these are a temporary links.